Growth - permanent increase in size and dry mass, by an increase in cell number or cell size or both. - due to an increase in cells, produced by mitosis. - controlled by hormones (in animals) and growth substance like auxins (in plants). Often used as a measure of growth, because wet mass varies from day to day (e.g. plant will take up more water on a wet day than on a dry day, but the water does not all become part of the biomass – living material of the plant). Obtained by drying out the organism in an oven (killing it). Many individual have to be germinated at the same time and grown in the same conditions. Samples are dried at various times during the growth period. 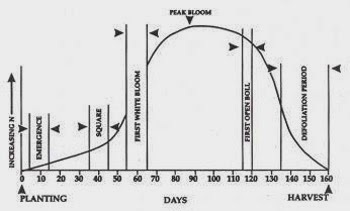 Example: Changes of dry mass during the growth of a plant from a seed. - ↓ slightly when the seed germinates, at day 2 (some of the stores in the cotyledon are being used in respiration). - ↑ when the plumule stars to photosynthesise, and foliage leaves form to continue the process. - ↓ at the end of the growth period (loss of seeds and fruits; leaves die). - increase in complexity of an organism as it grows. As the number of cells increases, they become differentiated (specialized for different tasks). - change in shape to adapt for a specific function. - xylem cells are elongated and lose their cell contents, with the cell walls becoming lignified so the cells conduct water efficiently. 1. Figure below shoes a section through a seed of a dicotyledon. 2. Figure below shows changes in mass of sets of pea seeds as they germinate and grow into seedlings, after germination set B was grown in the dark and set Q in the light.